There is so much I enjoy about making Vaybertaytsh. 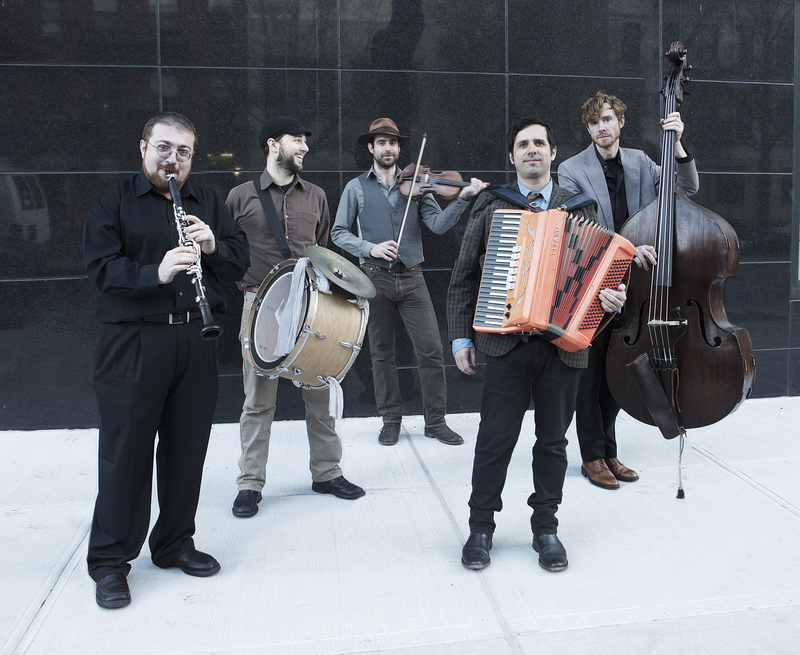 I love the feeling I get from the mixing of sounds—the lowering, raising, cutting, and pasting of Yiddish voices with all sorts of accents and diverse dialects. I love the intimacy the microphones create between the speakers, and the knowledge that the conversation gets a new life each time a listener hits play. But the biggest mayle of producing a podcast is that it is a completely portable creative outlet, in terms of both the technology and the manpower, pun intended. Where I go, Vaybertaytsh goes (and, by the way: where you go, it could go too. Be in touch to get involved). When my schedule allowed me to participate in a new Advanced Seminar for Researchers at the Naomi Prawer Kadar International Yiddish Summer Program at Tel Aviv University, I packed my lightest microphones, eagerly imagining the episodes my fellow students might create with them. What evolved out of a meeting of students is Vaybertaytsh’s first miniseries, Farvos. 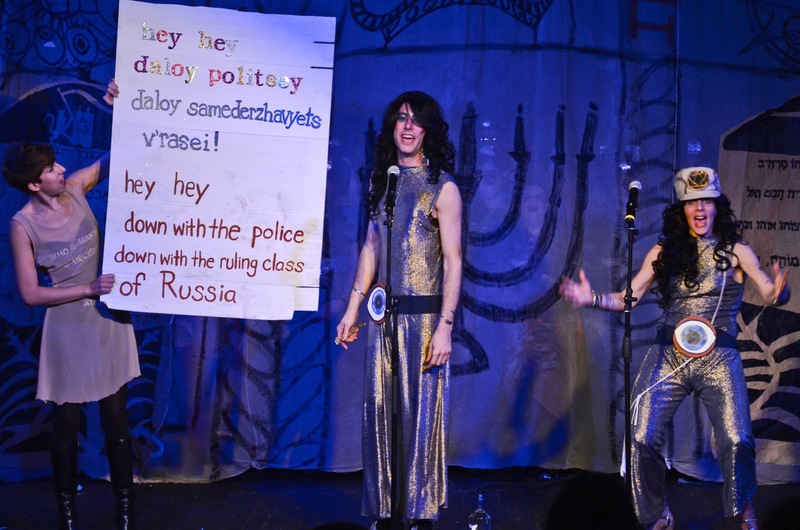 Each of the three episodes provides a different answer to the question “Why Yiddish?” The first episode, “Queer in Yiddish,” explores the connections between queer identity and learning and speaking Yiddish. The second episode, “Mamaloshn Academy?” addresses the blurry lines between the personal and the professional in Yiddish academia, and explores the role of spoken Yiddish there. The third episode, “Yiddish in the Making of Me,” addresses the role of Yiddish in students’ identities. The miniseries format allows Vaybertaytsh to go in new directions, departing from overtly feminist or female-centered themes and stories. Yet the episodes, as you will hear, still emphasize the experiences of women and queer folks in the Yiddish world, alongside cis-male feminists and supporters (who make up, interestingly enough, fully 50 percent of Vaybertaytsh’s listenership, according to our website’s analytics). Below are behind-the-scenes reflections on the making of “Mamaloshn Academy?” from two participants, Tanja Yakovleva and Gabriela Scherlis, and myself. You can listen to the episode here, or through your smartphones by subscribing on iTunes or Stitcher. I’m not Jewish. My interest in Yiddish came thanks to literature. Since I was a child, I have wanted to be able to read all sorts of books in their original languages, and I started to learn Yiddish two years ago during the Summer Program for Yiddish Language, Literature and Culture at Vilnius Jewish Institute in Lithuania. Sosye came that summer to present some of her research, and so when I met her for the second time on the Naomi Prawer Kadar Summer Program in Tel-Aviv this year, I was glad to find out that she had launched a feminist podcast for the Yiddish-speaking and Yiddish-curious. I knew I wanted to participate in it because it was modern, creative and, best of all, in Yiddish! Surprisingly, out of the one hundred and fifty participants in the program, only fifteen were interested in creating a podcast episode, but all of us were motivated and already had some ideas and interests to share. When I proposed the topic of Yiddish in academia, I had in mind to speak about the importance and legitimacy of Yiddish Studies as independent from the question of Jewish heritage. Soon our group came together, consisting of five students from five countries: Gaby (Argentina), Miriam (Canada), Noemi (Norway), Yeshua (USA), and me (Ukraine). Everyone had their own story about how they came to Yiddish Studies, and from these stories we built five questions around the topic of Yiddish academia to use in the podcast. 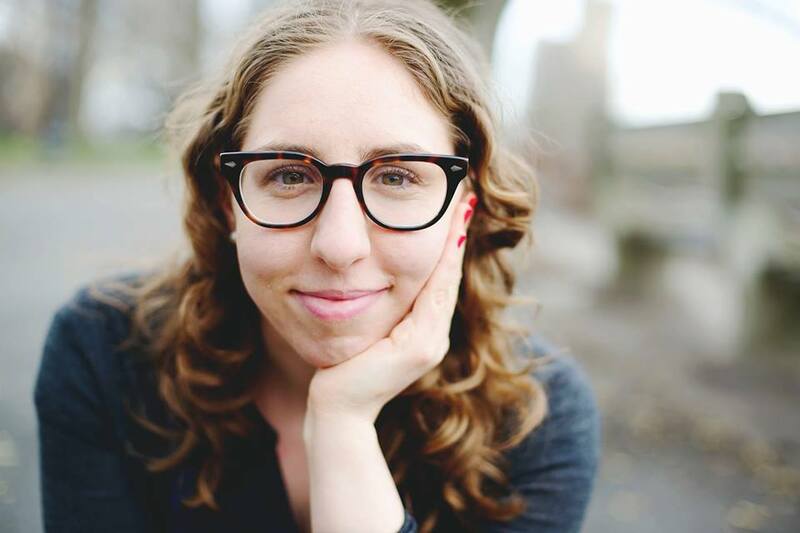 We then asked Miriam Trinh, our incredible Yiddish teacher, to moderate our project. This group of students felt we needed to get together once before recording, in order to talk about our responses to the questions and to create a sensible sequence. We decided to discuss it over dinner, and the atmosphere that night allowed us to get closer with one another and to speak more openly than ever before. When it came time to record, we already had an atmosphere of familiarity. Our palpable moyre to speak Yiddish on the microphones did not cloud our excitement and positivity. Anastisya (Ukraine) joined us last minute when Noemi could not make it, and we recorded the project with Sosye within the span of two hours. Honestly, if we were not so tired and hungry after a day of lessons, we could have kept on discussing the issues for much longer. All in all I am very grateful to Vaybertaytsh for the experience and the possibility to create something on our own, which we hope will be of interest to others. I gained not only the experience of making a podcast episode, but also new friendships with the other participants. I think that more such projects could help Yiddish stay alive in everyday use. I had listened to several Vaybertaytsh episodes from Buenos Aires, but I never quite imagined I would have the chance to join in one of them, so I was happy when I heard about the possibility of partaking during the summer course in Tel Aviv. Sosye encouraged students of every level to participate, so despite of my linguistic insecurity with Yiddish, I decided to join in. We held a meeting after classes to exchange ideas, interests, and concerns. We divided into different groups based on which question we were interested in exploring: what connects us to Yiddish, or why we study the language. When it came down to recording, the atmosphere was calm. We felt supported by both the total freedom and the recommendations that Sosye provided, and we were stimulated by the leadership of the conversation’s moderator, Miriam Trinh. We discussed how the boundaries between professional and personal life in Yiddish studies are often blurry. When people ask academics where we have learned Yiddish, they are often surprised when we say that Yiddish is not the language of our parents. Tanja spoke about how problematic it is that so many people think one needs to be Jewish in order to have an interest in Yiddish culture. She remarked that Yiddish culture can attract anyone, just like Japanese or Italian or any other language on earth. Another question that came up was whether studying Yiddish professionally makes one a Yiddishist. We all agreed that, as a language that has lost many of its speakers, there are different expectations and responsibilities for us than for researchers of other languages, perhaps rightfully so. Yet this is not the same thing as identifying as a Yiddishist. This distinction opened up a related discussion surrounding whether we as researchers need to know how to speak Yiddish, or if reading it for our research is enough. As Yeshua Tolle said during the episode, we in Yiddish Studies exist in a space “between nostalgia and innovation.” I believe that we must live in the present and take part in the reinvention of Yiddish for the future, all the while remembering the importance of history. 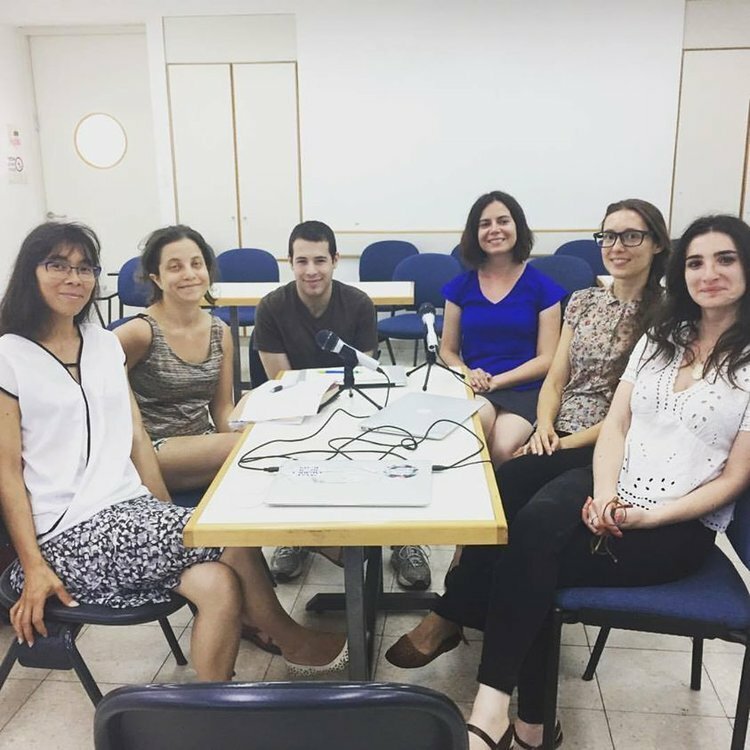 The summer course in Tel Aviv, and the podcast we made during it, allowed us to rethink and reinforce our connection with Yiddish, and to build new connections between us as Yiddish scholars. Producing “Farvos” during the Naomi Prawar Kadar International Yiddish Program presented an exciting opportunity to make Vaybertaytsh episodes communally. It was thrilling to see the participants’ faces transition from fear to comfort to excitement as they expressed themselves in Yiddish on deeply personal and meaningful topics, often for the first times in their lives. I look forward to working with other Yiddish programs and retreats to make episodes communally, in formats that allow for the inclusion of diverse voices and opinions. “Farvos” also brought up a series of new challenges for me as an editor, moderator, producer and participant—some technical, and others philosophical. Even though our project had no official role in the Prawar program’s schedule, “Mamaloshn Academy?” led me to wonder where class ended and Vaybertaytsh began. Should those in the room who spoke Yiddish at higher levels of fluency have corrected beginner and intermediate students as we went along, or was it best to empower everyone to speak freely? Should I drive myself crazy during the editing process by copying and pasting verbs into the second place, or by fixing the placement of zikh? As I watch the numbers of Vaybertaytsh listeners grow month to month, knowing full well that it has become particularly popular among Yiddish students, I question what my responsibilities are to those learning the language and, perhaps more importantly, to the language itself. I began the podcast professing my commitment to encouraging contributors to speak Yiddish freely, not allowing people (in particular, women, queer folk, and youth) to feel silenced by the imaginary (okay, maybe a little real) Yiddish grammar police. On the one hand, making “Farvos” strengthened my commitment to this original mission. On the other hand, I know that Vaybertaytsh has become something of a pedagogical tool for many of its listeners, and at times, its participants. As Vaybertaytsh expands the breadth of its guests beyond native speakers, Hasidic or formerly Hasidic women, and long-time, devoted Yiddishists, I ask myself: what kind of pedagogy should Vaybertaytsh espouse? Going into the show’s second year, I have not yet come up with an answer, but I am glad that my experience producing “Mamaloshn Academy?” began this worthwhile process of consideration. Fox, Sandra . “Behind the Scenes: Vaybertaytsh’s “Farvos” Series and the Making of “Mameloshn Academy?”.” In geveb, August 2017: https://ingeveb.org/blog/behind-the-scenes-vaybertaytshs-farvos-series-and-the-making-of-mameloshn-academy. Fox, Sandra . “Behind the Scenes: Vaybertaytsh’s “Farvos” Series and the Making of “Mameloshn Academy?”.” In geveb (August 2017): Accessed Apr 20, 2019.